Headaches and stabbing neck pain, diagnosed as occipital neuralgia, can be treated with an occipital neuralgia nerve block. 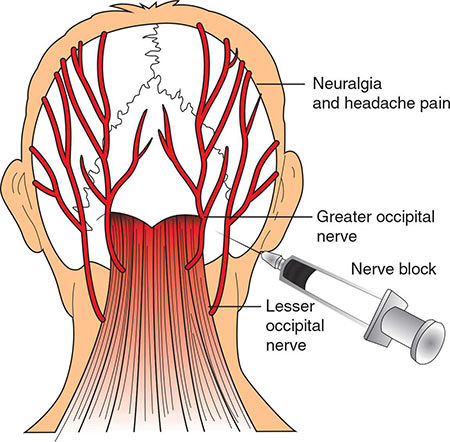 Occipital nerve blocks are medicated injections that prevent the nerves from transmitting pain signals to your brain. The occipital nerve block procedure can be done in your NYC sports injury doctor’s office by the best occipital nerve block specialist in New York. The chance of an occipital nerve block migraine or any other side effect is very low. Your occipital nerves run through the muscles at the back of your head, just above your neck. There are two occipital nerves, one on either side of your head. When healthy, they carry physical sensations from the top and rear of your head to your brain. A jarring neck injury to this part of your head, like the kind you can get from playing football or rugby, can damage one or both occipital nerves, causing neck pain and headaches. You may also suffer from this type of pain, also referred to as occipital neuralgia, if your occipital nerves are inflamed or irritated. If this describes the pain you’re suffering from, you’re a good candidate for an occipital neuralgia nerve block at your Midtown Manhattan sports medicine doctor’s office. The pain from a pinched or damaged occipital nerve appears on just one side of your head, unless both nerves were affected. You may feel a sharp and stabbing pain that can radiate toward your eye. It can make your forehead so sensitive that you can’t wash your hair, wear a hat or rest your head on a pillow. Occipital nerve pain makes it difficult to maintain your lifestyle. Occipital nerve blocks are designed to relieve you of the pain from one or both occipital nerves. A nerve block injection interferes with the nerve’s capability to send pain signals to your brain. You may need more than one treatment for it to reduce your pain, but occipital nerve blocks can remain effective for several months. You lie on the x-ray table, face down. The area at the back of your head is numbed with a local anesthetic. Unless you’re particularly nervous about the procedure, you don’t need a sedative. Your doctor uses a fluoroscope, which sends a series of real-time x-ray images to a monitor. Using the monitor as a guide, your doctor inserts a thin needle to reach your occipital nerves. Once the needle is in place, a combination of steroid medicine, saline and local anesthetic is injected to wash over your nerve. The doctor withdraws the needle. You’re watched for a short time, anywhere from 15 minutes to an hour, depending whether you had a sedative or not. Then you’re cleared to return home. If you did have a sedative, you need someone else to drive you home. The anesthetic in the injection kills your pain immediately, but that’s just a temporary fix, and the anesthetic wears off after a few hours. So, you can expect your pain to return. You may even experience an occipital nerve block migraine headache, as your head is sore from the injection process and from the medication itself. Remember, this pain is also temporary. Within three days, the steroid medicine begins to work, and you should notice a drastic decrease in your pain level. The pain may not disappear completely, but it should drop to a manageable level. If not, contact your doctor. You can have multiple occipital nerve blocks, but most sports and pain doctors won’t exceed three shots in a six-month period. Normally, the pain-killing effect of an occipital neuralgia nerve block lasts up to three months. You shouldn’t have an occipital neuralgia nerve block if you’re on blood-thinning drugs, have an untreated heart condition or suffer from diabetes. Also tell your doctor if you have an active infection in another part of your body. You may have to reschedule your occipital nerve block procedure. Contact your New York City doctor right away if you experience worsening pain or the symptoms of a fever. Remember that the pain-killing effects of the steroid medication don’t start to work until two or three days after your occipital nerve block procedure. Don’t exert yourself while you’re waiting for the medicine to do its job. Once the pain has eased, you can return to your normal routine. Do you have any questions about the occipital nerve block we offer for neck pain in NYC? 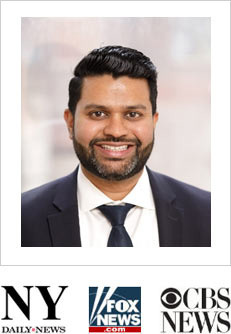 Would you like to schedule an appointment with the best rated neck pain doctor Febin Melepura MD of sports pain clinic in NYC? Please contact our office for consultation with the top pain relief specialist in Midtown Manhattan.